You are here: Home / VMware Tools For Apple Mac OS X Guests? 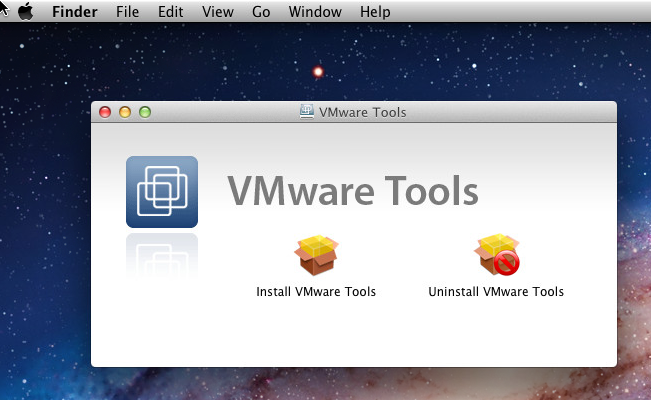 With the release of vSphere 5, virtualizing Apple Mac OS X as a guest OS was possible and fully supported from VMware. To do so, you would need to be run ESXi on Apple hardware either the now deprecated Apple XServe 3.1 or an Apple Mac Pro. A comment that came up yesterday on Twitter was that VMware Tools did not exists for Mac OS X guests and this would make it difficult to manage Mac OS X guests on vSphere. I guess it may not be that well known or just an assumption, but VMware Tools does in fact exists for Mac OS X guests and it is also documented in the VMware Tools installation guide. It is still amazing to me to see the number of guest OSes the vSphere platform supports and perhaps virtualizing Mac OS X is still relatively new for folks and hence the initial assumption about VMware Tools not being available. In any case, I thought I take you through a few screenshots of installing VMware Tools for a Mac OS X 10.7 guests running on my Apple Mac Mini. In the screenshot below, we can see that VMware Tools is not detected in the guest OS and we have a option to install VMware Tools, so we go ahead and click on that. This will mount the darwin.iso to the VM from the vmimages directory of the ESXi host and you can proceed with the VMware Tools installation. Upon finishing the installation, you will be asked to reboot the guest OS and now when we take a look at the VM summary view, we can see VMware Tools is now running in our Mac OS X guests. Note: For instructions on installing Apple Mac OS X as a guest OS on vSphere, please refer to this tech note. 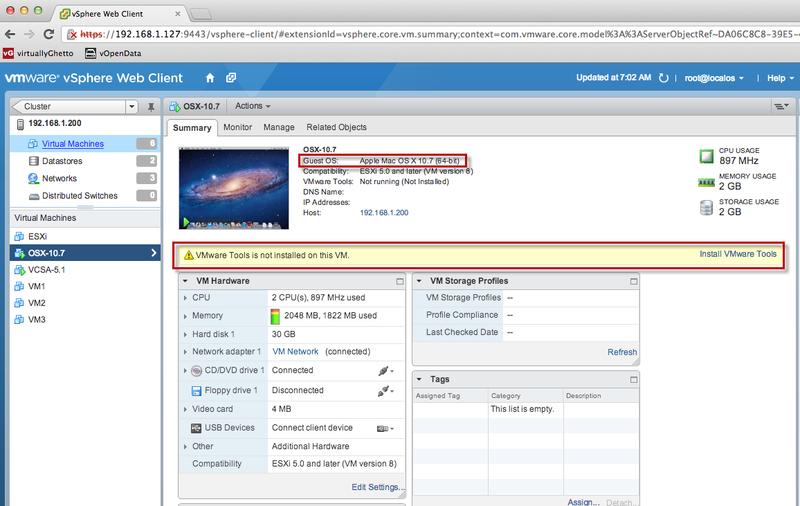 When Can I Run Apple OSX on vSphere 5? I notice Compatibility is set to VM Version 8, have you had any experience upgrading to vmx 9. Also is it possible to build the OS X VM as vmx 9 in the first place, all my experience to date has failed, i.e. upgrade to vmx 9, OS X will not boot, and even creating a custom VM only get VM Version 8 as an option.